1877,JAPAN. 5 Sen, Year 10 (1877). NGC MS-64.Y-22; JNDA-01-35. Characters seperated. lightly toned. 1876,JAPAN. 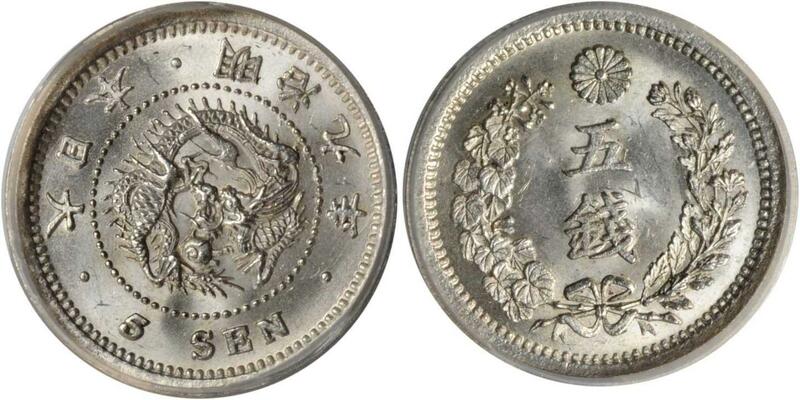 5 Sen, Year 9 (1876). NGC MS-64.Y-22; JNDA-01-35. Characters seperated. Dark attractive multicolored toning. 1876,JAPAN. 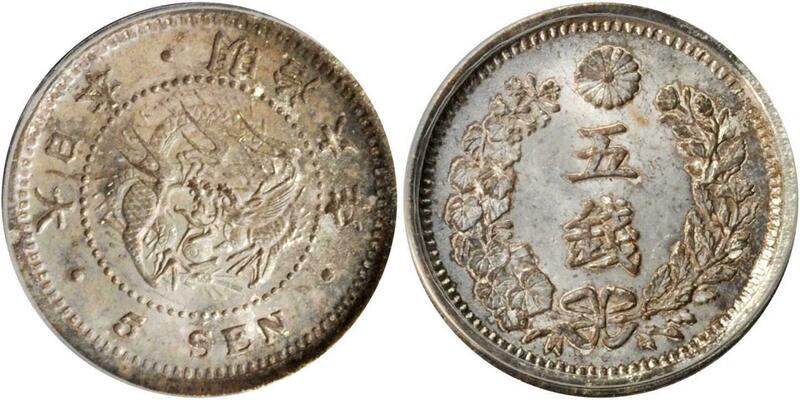 5 Sen, Year 9 (1876). NGC MS-65.Y-22; JNDA-01-35. Characters separated. Well struck and attractively toned. 1877,JAPAN. 5 Sen, Year 10 (1877). ANACS MS-64.Y-22; JNDA-01-35. Type II, Characters separated. Sharply struck with attractive matte surfaces. Lightly toned. 1876,JAPAN. 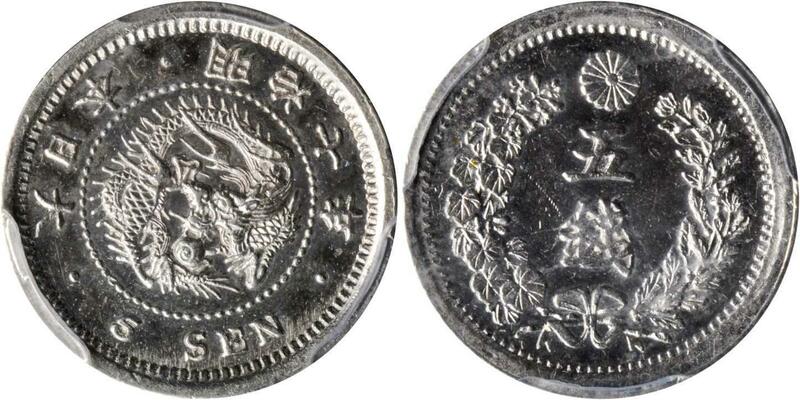 5 Sen, Year 9 (1876). ANACS MS-65.Y-22; JNDA-01-35. Type I & IV, Characters connected; Reverse bottom character for "Sen" has hook in bottom right stroke. Sharply struck with attractive matte surface. 1875,JAPAN. 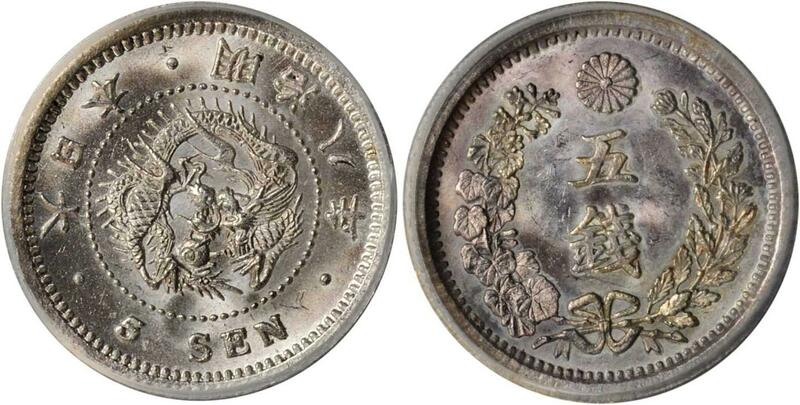 5 Sen, Year 8 (1875). ANACS MS-65.Y-22; JNDA-01-35. 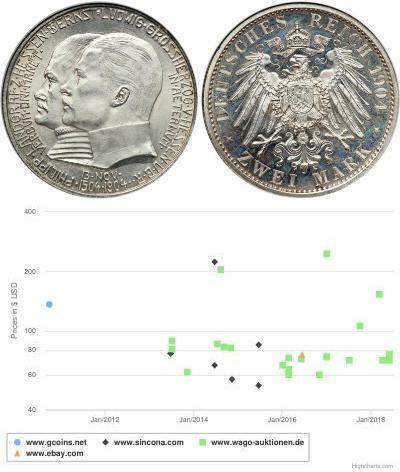 Type II, Characters connected. Sharply struck with only the slightest bit of light peripheral toning. 1876,JAPAN. 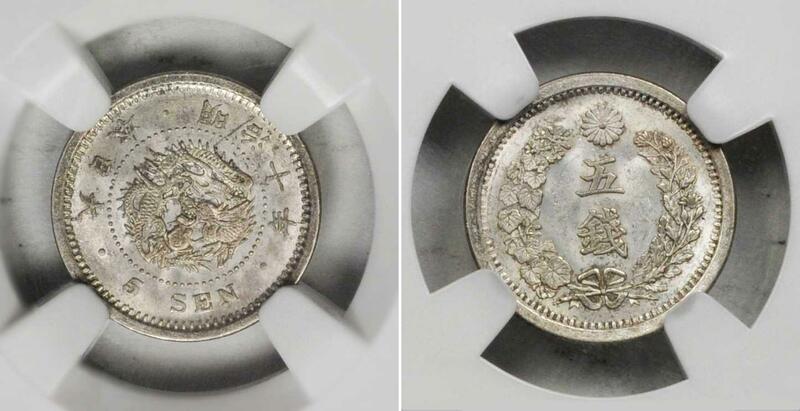 5 Sen, Year 9 (1876). NGC MS-65.Y-22; JNDA-01-35. Characters separated. Toned with russet highlights over lustrous surfaces. 1876,JAPAN. 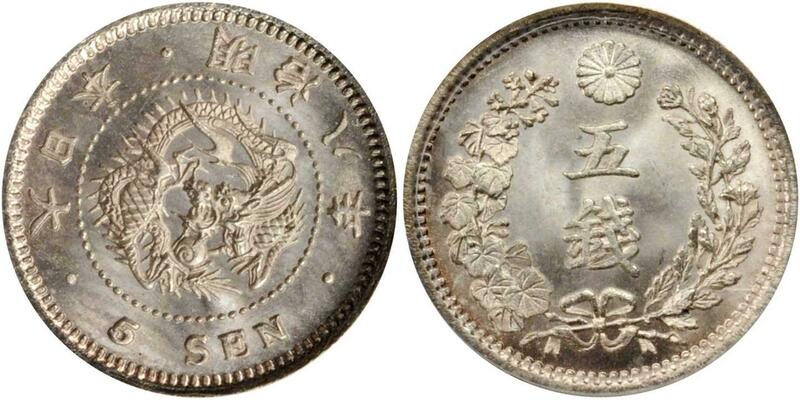 5 Sen, Year 9 (1876). ANACS MS-63.Y-22; JNDA-01-35. 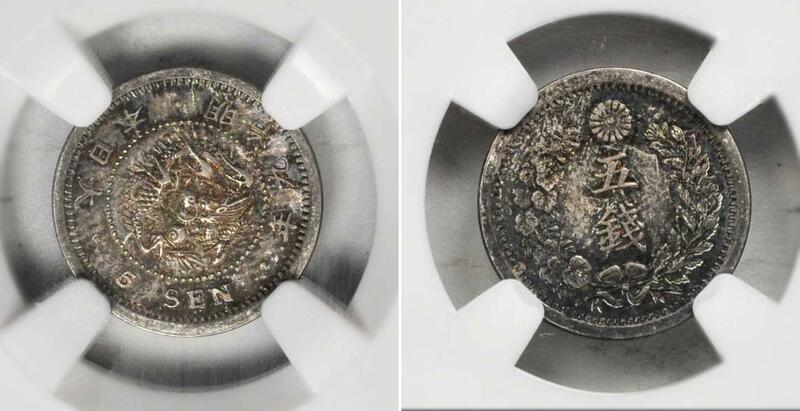 Type I Obverse & Type III Reverse. Attractive satin surfaces. 1875,JAPAN. 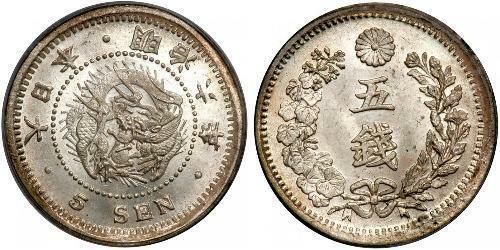 5 Sen, Year 8 (1875). ANACS MS-63.Y-22; JNDA-01-35. 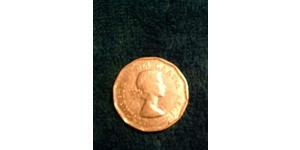 Type I Obverse & Type III Reverse. Light attractive toning. 1877,JAPAN. 5 Sen, Year 10 (1877). NGC MS-66.Y-22; JNDA-01-35. Characters separated. A bright and lustrous example with sharp details. Tied with seven others at this NGC grade with only two graded higher. 1873,JAPAN. 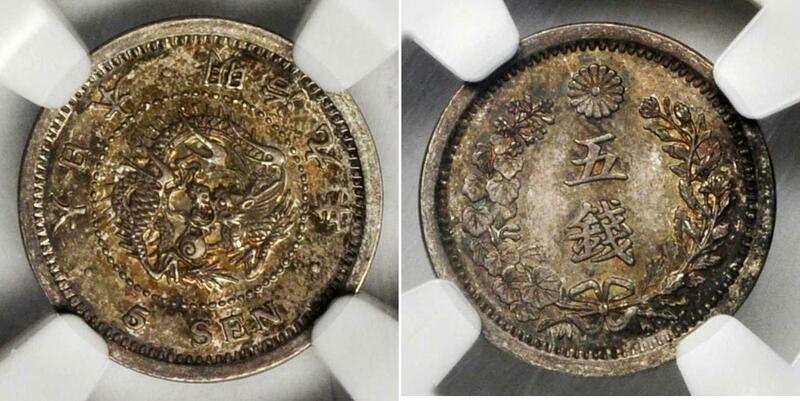 5 Sen, Year 6 (1873). ANACS MS-60.Y-22; JNDA-01-35. Type II, Characters separated. Somewhat musty from sitting in a flip for an extended period of time. Scare variety with light iridescent toning showing hints of red.